This book explores the work of the late-medieval English writer Thomas Hoccleve. It highlights Hoccleve’s role, throughout his works, as a religious writer: an individual who engages seriously with the dynamics of heresy and ecclesiastical reform, who contributes to traditions of vernacular devotional writing, and who raises the question of how Christianity manifests on personal as well as political levels. It suggests a role for Hoccleve as a poetic mediator, capable of mediating between the increasingly militant English church and an incipient English literary tradition, and it highlights Hoccleve’s role in transforming the figure of Chaucer in the first decades of the fifteenth century. It argues that the version of Chaucer presented in Hoccleve’s Regiment of Princes – august, devout, and conspicuously religious – is not a pre-formed artifact, but rather a Hocclevian invention; and it indicates the ecclesiastical, political, and literary contexts that make this version of Chaucer both possible and necessary. 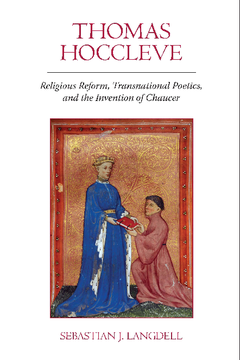 This study also situates Hoccleve’s accomplishments in a transnational poetic context – offering French and Italian precedents for Hoccleve’s moralization of Chaucer, while examining the influence of contemporary French poetry on Hoccleve’s work. It positions us to reconsider Hoccleve’s role within English literary tradition, and to better understand the way heresy and religious reform surface in late medieval poetry; and it affords us a more nuanced context for Chaucer’s positioning as a literary 'father' figure in this period. Sebastian J. Langdell is Visiting Assistant Professor of English at Vassar College in New York. He is a founding member of the International Hoccleve Society, and has previously held lectureships at three Oxford colleges: Somerville, St. Edmund Hall, and Balliol.